(L-R)Walton Flooring Centre managing director James Harper with Paul Trickett of Bathgate Business Finance outside Walton Flooring Centre headquarters in Huyton. The Liverpool-based flooring company, which won the Business Expansion Award at this year’s DIY Week Awards, has set its sights on ambitious growth plans, with a move to a new 36,000sq ft unit in Huyton next year after securing a quarter of a million pound bespoke finance package. Walton Flooring Centre worked with Wirral-based finance specialists, Bathgate Business Finance to secure a series of deals that would support the expansion plans of the family-owned business. 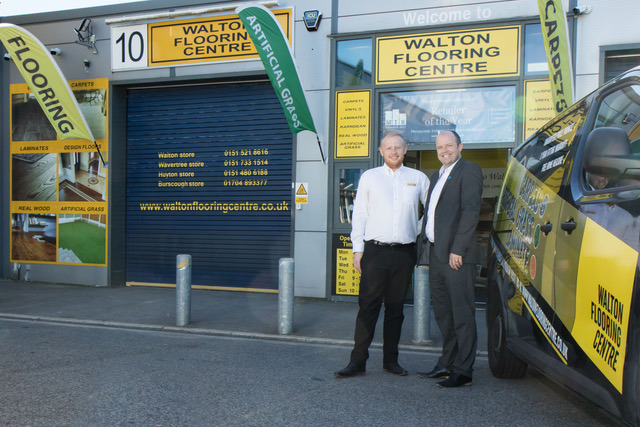 The largest family-owned flooring company in the North West, Walton Flooring Centre has grown from just one store in Walton in 2011 to five across the region in less than seven years. Established in 2011 by father-and-son team Edward and James Harper, the business was launched on a modest budget of £9,000. The pair explained they worked seven days a week “and clocked up four measures a night” to meet unprecedented demand for their products and service. The company responded to this demand by opening branches in Wavertree, Huyton, Burscough in West Lancashire and - most recently - Moreton, Wirral in September 2017. A move into the lucrative contract market in 2018, with its high upfront purchase costs and longer payment terms, combined with a challenging period for retail sale at the start of the year, moved the company to seek short term cashflow support to enable it to continue its growth plans. Woods Squared Limited managing director, accountant Alan Woods introduced Walton Flooring Centre’s Edward and James Harper, to Paul Trickett at Bathgate Business Finance. The finance specialists brokered a number of deals that allowed Walton Flooring Centre to redistribute tax and VAT payments. It also secured two working capital loans worth a total of £110,000 to finance everyday operations, ensuring the company had enough money in reserve to support its expansion strategy and foray into contract work. With finance in place, the flooring firm now plans to move from its current 6,000sq ft headquarters to a new 36,000sq ft unit in Huyton in early 2019, which will house its head office function, Huyton operations, warehouse and a training academy. It also aims to accelerate its store launch programme; planning five new locations for 2019 creating an estimated 11 new jobs, as well as launching two e-commerce websites to further increase revenue. Managing director James Harper said: “Despite a challenging start to the year we’re approaching our busiest sales period in an extremely healthy position. We are starting to see the results of our investment into the contract market, which is a new area for us and significant opportunity to increase revenue. Bathgate Business Finance Paul Trickett said: “It has been a pleasure to support James and Edward through this growth cycle and help a truly fantastic family business continue to thrive. Within the past 12 months Walton Flooring Centre won the Business Expansion Award a the DIY Week Awards, and was named Business of the Year at the Echo Regional Business Awards 2018. It has also recently been shortlisted in the Retailer of the Year category at the Merseyside Independent Business Awards 2018.